Azerbaijan’s leading chess player, GM Teimour Radjabov, speaks about the upcoming match World vs. Azerbaijan in an interview with extratime.az Deputy Chief Editor Teimour Tushiev. Tushiev: How important is this match for you? Could possible victory give the national team of Azerbaijan a boost in self-confidence and encouragement for successful appearance at the official competitions? Radjabov: To me, personally, it is always a privilege to play for our national team. And particularly in such an important match. Also, symbolically, the match is taking place right before the birthday of our national leader Heydar Aliyev, as President Cup, who did so much for the development of chess, first in the Soviet Azerbaijan, and later in the independent country. Despite the fact that this match will be of friendly character and serve in popularization of chess, I anticipate a fierce struggle for the positive result, as there are ambitious players on both sides. This match will be remembered in history of the world and Azerbaijani chess. Tushiev: In your opinion, will the arrival of current and former world champion in Azerbaijan provide a new momentum for the development of chess? Radjabov: Undoubtedly. The world chess champion is a cult figure, and Viswanathan Anand also has this special, I would say mysterious aura, that always makes him a dear guest in any competition in any part of the world. Vladimir Kramnik was for many years on the very top of the chess Olympus, and still is, and this speaks for itself. He has a huge number of fans all over the world. Tushiev: Let’s talk about each player from the team of World. Vishy Anand, one might say, slightly disappointed in Linares, by not presenting the play level which is expected from a world champion. However, in rapid chess, it is hard to find him competition. What can now be expected from Anand? Radjabov: Vishy Anand is always Vishy Anand, a brilliant chess player, who won everything there can be in one’s chess career. Traditionally a strong opponent. Besides, Anand is current world champion, not only in the classical, but also in rapid chess. Tushiev: Vladimir Kramnik appears to be even greater mystery at the moment, having missed several major tournaments, and it is probably difficult to estimate his form now. But, judging by an recent interview, given to “Soviet Sport”, he intends to win back his position. What can be expected from the “Resurrected” Kramnik in this match? Radjabov: Vladimir Kramnik is an outstanding Russian chess player. He is renowned by his fantastic positional understanding, he defeated Garry Kasparov in a match for the world chess crown in 2000 and then continued to hold this leading position over the years. Now former world champion, being forth in the world rating list. Very strong as in rapid chess. 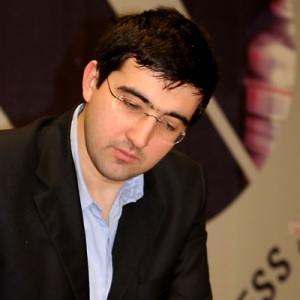 Kramnik will certainly make every effort to reclaim the chess crown in near future. - Alexey Shirov is member of the world chess elite for many years already. Very creative player. His style of play resembling the one of legendary Mikhail Tal. Looking at the recent tournaments, Alexey is in good form. - Sergey Karjakin is one of the best young chess players in the world. His results have not always been constant, but that is normal for his age. But the win at the Corus tournament inspired new confidence in his fans. In any case, Sergey’s participation in the team of the world is completely logical. - What was the most memorable in the first days of the tournament? - There were several interesting games in the first round that were rather dramatic. One of the most interesting games was between Vasily Ivanchuk and Peter Svidler. Ivanchuk was running out of time and though he played very well, he hadn’t enough time to solve all the problems and as a result he lost. Levon Aronian is a convincing leader. He has two wins. It is quiet a good start. But it is difficult to judge after the first two rounds. I watch with great interest how the grandmasters of the new generation compete to each other. It is very interesting to follow the style of struggle and to find out who is the dark horse. We know the white horses – they are our favorites. - Are you going to continue the player’s career? - The point is that I am 72 and what is the most difficult is to bear the tenseness of the struggle. I can’t do it anymore. I can play one-two games when I am invited to some contest but it is impossible for me to whole distance. The most necessary condition to be able to play in the tournaments is to feel like you are ready to “kill” everyone, but I am very shy and now I don’t want to win. If I win I don’t feel any joy but I don’t like to lose. And it is very boring to make draws. I have already made a lot of them. I can tell you that now the old age comes to chess very early. Flourishing comes very early at 26-28. We became champions at 32. I became the champion at 32, Bobby Fisher was a bit younger, Karpov was 24, but he didn’t play the World Championship match. Lasker was 24, and it was the 19th century time. - Are you going to attend the club “Ladja” and play simultan or may be something else connected with chess? - Now I don’t have any special program of getting acquainted with the chess life in the republic and namely Nalchik. But there are two things I would like to do- I want to visit the chess club and the local museum of regional studies. This is the minimum program, and I think that it is also the maximum that I can do. As far as I know we have two days off and there are definite touristiс programs on these days. And, of course, I would like to join our chess herd, pardon me for the expression. - What do you think of the today’s system of determining the World Chess Champion? - I have never thought of the ideal system. It always seemed to that the title of the champion has lost it significance. I think now it would be reasonable to hold one tournament of claimants of the year and there should be the World Champion of the definite year. But, on the other hand, after Anand, who is the World chess champion now, had won the last game with Kramnik, the significance of the title became more important. And I am happy about this. Speaking about the idea of taking such kind of series in which the selection will be made on the pyramid scheme, which consists of six tournaments, I must say that it is not a new idea. I have an experience of participating in tournaments, made on the GMA. There were also four tournaments and the three best results were taken into consideration. I can’t judge whether it’s reasonable or not. May be it is a little bit complicated. And especially for now, when it is quite difficult to find money for organization of competitions. - Don’t you think that chess needs a new Bobby Fisher? It seems to that grandmasters are apart, spectators are apart, and chess is also apart. - I think now it is Magnus Karlsen from Norway. He can play this role, because he attracts in the chess world by his young age and the quality of his play. He has quite an interesting and rich play, moreover hу is a very brave boy; he goes forward whether he wins or looses. He also plays endgames well like Bobby Fisher in his time. But if you mean that there must be an extravagant figure, some kind of showman, I can say that we don’t see such a person for now. And possibly we won’t see him. - After the chess crown had returned to Russia, women’s chess became more popular. What’s your attitude towards it? - Speaking about the women’s chess, I’d like to say that I glad to know that the professional work is paid well in chess too. - Our chess school was the strongest one in the time of the USSR. How is it now? - Unfortunately, now there is a split. We may talk a lot about the so called reconstruction, or think what has happened with the country and so on. Many players, who grew up and got chess education of the high level here, left the country. That’s the thing with me. I went to France in 1976. I have been living there for 34 years. I think now the title of the champion became underestimated, but it is not because the interest to chess has decreased. The thing is that now the competitors have a little disparity and for this reason I don’t take the one who wins as the World Champion. He just gets the title. But in my time everyone used to be the official champion for three years. But I’d like to add that there were persons like Misha Tal. He had been the champion only fort a year. However, he was a very bright figure in chess. I think the chess world would be very boring if there wasn’t Misha Tal. His work was very useful. I can remember once when I was a participant of the tournament in Belgrade I met amateurs who were discussing the tournament. One of them said: ” No Tal- no tournament.” So there is the other reason why the titles are being underestimated. I was always fond of the history of chess, and it was very interesting to learn more about the chess world which had different steps of development. The first World Champion, the conditions which were that time. And what we have now: if your phone rings you get no point. I wish I lived in the 19th century. - What do you think of the coach career? - The talent of coach is a special one. You can be an excellent chess player, but at the same time an absolutely untalented coach. I have an example. I was asked to work with Flora Dmitrieva, who was the champion of Leningrad. I agreed but didn’t understand what it would be like. She had already been the champion of Leningrad. So, I gave her a piece of advice:” Flora, don’t think about the debut, just play as you like and as you see.” So she did at the next championship and she was the last. After that I realized that I should be very careful with my coach talent. But watching Bondarenko, who had a real talent, I understood that it is easier to be a head of the school then to work. Now I am reading the lectures on general chess items because I have a great experience. It calls “How I became the champion”, “The most offending lost”, “The way one shouldn’t play chess”. I have a great number of such stories. So, before I agree to become the head of the school I had thought it other very carefully. Now we hold two sessions in my school in Satka Chelyabinsk region, a winter session and a summer one. There are about 30 pupils there. Now their number will be decreased. I think that my lectures can be very useful, because I am a kind of a magnet that attracts and unit children. And I can also make serious professional remarks at the coach lessons. That’s why I value my chances as 50/50. I like to watch the youngsters and to point out their strong and weak sides, comparing them with my generation. What do you think regarding computer influence to chess, do you see a positive moments of it? It’s very important to take into consideration that computers have changed chess. The drawback of them is that many games begin only with the 35-th move or even later. So you are immediately involved in endgame and there is no live game. But there is also a great advantage about them. For example, Grandmaster Bondarevsky and his wife spent a month to type the debut repertoire of Bobby Fisher. Now, you find the program and you can have everything in half a minute. It’s really a great advantage. The computer is important on the high level when the value of the move is high. It’s very important to learn to work with the computer. It must be our servant; we should not let it become our master, other wise we will fail. - How did you earn your first “chess money”? - I got my first chess money in 1948 when I was giving simultan chess play in the Officers’ House in Minsk. I was 11 then. In game I checkmated one officer. He asked to return his move. So after two moves I was checkmated. I began to cry bitterly and the game was stopped for 15 minutes. When I calmed down I finished the game. Since that time I never return the moves. I got a very sad experience. Speaking about money, I got the sum on which I could buy a winter coat. So that was money, tears and a coat. - Which of your games you can call “evergreen”? - I think that the evergreen game is the game with Bronstein in 1960. There was a very good balance between the strategy and tactics. This idea was used in one of the movies of James Bond. Boris Vasilievich Spassky, born January 30, 1937, is a Russian-French chess grandmaster. He was the tenth World Chess Champion, holding the title from 1969 to 1972. At age 16, Spassky scored very impressively in 1953 at a strong international tournament in Bucharest, Romania, finishing tied 4th-6th with 12/19, as the winner was his future trainer Alexander Tolush. 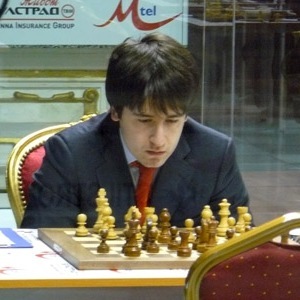 He was awarded the title of International Master by FIDE. In his first attempt at the Soviet Championship final, URS-ch22, Moscow 1955, at age 18, he tied for 3rd-6th places with 11½/19, as the joint winners were Vasily Smyslov and Efim Geller. This excellent result qualified him for the Goteborg Interzonal later that year. At age 18 he won the World Junior Chess Championship held at Antwerp, Belgium, with a dominant score of 14/16, and became a Grandmaster, the youngest ever at the time. Spassky competed for the Lokomotiv Voluntary Sports Society. By his tied 7th-9th place, with 11/20, at the 1955 Goteborg Interzonal, he qualified into the 1956 Candidates’ Tournament, held in Amsterdam. There, he finished in the middle of the ten-player world-class field, tied 3rd-7th places with 9½/18, astonishing for a 19-year-old. Expectations for him were very high, and this put pressure on the young star. At the 1956 Soviet final, URS-ch23, held in Leningrad, Spassky tied for 1st-3rd places on 11½/19 with Mark Taimanov and Yuri Averbakh, but Taimanov won the further playoff to become champion. Spassky then tied for first with Tolush in a strong Leningrad tournament later in 1956. Spassky was considered an all-rounder on the chess board, and his adaptable “universal style” was a distinct advantage in beating many top Grandmasters. In the 1965 cycle, he beat Paul Keres at Riga 1965 with careful strategy, triumphing in the last game to win 6-4 (+4 =4 -2). Also at Riga, he defeated Efim Geller with mating attacks, winning by 5½-2½ (+3 =5 -0). Then, in his Candidates’ Final match (the match which determines who will challenge the reigning world champion for the title) against Mikhail Tal the legendary tactician (Tbilisi 1965), Spassky often managed to steer play into quieter positions, either avoiding former champion Tal’s tactical strength, or extracting too high a price for complications. He won by 7-4 (+4 =6 -1). This led to his first World Championship match against Tigran Petrosian in 1966. Spassky won two tournaments in the run-up to the final. He shared first at the Chigorin Memorial in Sochi in 1965 with Wolfgang Unzicker on 10½/15. Then he tied for first at Hastings 1965-66 with Wolfgang Uhlmann on 7½/9. Spassky lost the final match in Moscow narrowly, with three wins against Petrosian’s four wins, with the two sharing 17 draws. However, a few months after the match, Spassky finished ahead of Petrosian and a super-class field at Santa Monica 1966 (the Piatigorsky Cup), with 11½/18, half a point ahead of Bobby Fischer. Spassky also won at Beverwijk 1967 with 11/15 ahead of Anatoly Lutikov, and shared 1st-5th places at Sochi 1967 on 10/15 with Krogius, Alexander Zaitsev, Leonid Shamkovich, and Vladimir Simagin. As losing finalist in 1966, Spassky was seeded into the next Candidates’ cycle. In 1968, he faced Geller again, this time at Sukhumi, and won by the same margin as in 1965 (5½-2½, +3 =5 -0). He next met Bent Larsen at Malmö, and won by 5½-2½. The final was against his Leningrad rival Viktor Korchnoi at Kiev, and Spassky triumphed with 6½-3½. This earned him another challenge against Petrosian, at Moscow 1969. Spassky’s flexibility of style was the key to his eventual victory over Petrosian by two points in the 1969 World Championship. Spassky won by 12½-10½. During Spassky’s three-year reign as World Champion, he won several more tournaments. He placed first at San Juan 1969 with 11½/15. He won a very strong tournament at Leiden 1970 with 7/12. Spassky shared 1st-2nd at Amsterdam 1970 with Lev Polugaevsky on 11½/15. He was third at Goteborg 1971 with 8/11, behind winners Vlastimil Hort and Ulf Andersson. He shared 1st-2nd with Hans Ree at the 1971 Canadian Open Chess Championship in Vancouver. Spassky’s reign as a world champion only lasted for three years, as he lost to Bobby Fischer of the United States in 1972 in the “Match of the Century”. The contest took place in Reykjavík, Iceland, at the height of the Cold War, and consequently was seen as symbolic of the political confrontation between the two superpowers. Going into the match, Fischer had never won a game from Spassky in five attempts, while losing three times. In addition, Spassky had secured Geller as his coach, and Geller also had a plus score against Fischer. However, Fischer was in excellent form, and won the title match convincingly, by 12½-8½. Although Spassky did lose the title match, he performed much better than had the three other Candidates (Mark Taimanov, Bent Larsen, and Tigran Petrosian) whom Fischer had defeated convincingly on his approach to the finals. Spassky played board one in the USSR vs. Rest of the World match at Belgrade 1970, scoring 1½/3 against Larsen. The first list of participants of this year’s summer chess festival in Ikaria has been made available (scroll down for the list of players). Although there are several months to the start of the event, strong GMs and IMs have already joined the list, attracted by the good conditions and the beeautiful narture of the island. The Chessdom editors had the chance to speak to the man behind the festival, Dimitris Skyrianoglou. Chessdom: Here we are with Dimitris Skyrianoglou, the tournament director of the 2009 Ikaros Chess Festival, one of the major open events in Europe during this summer. As we were reading through the brochure of the tournament, we were very amazed of the multiple conditions offered to players, some of which actually getting paid for their rating points. As an organizer, how do you manage to provide such fantastic conditions in the current financial crisis? Dimitris Skyrianoglou: Before anything else I would like to stress that Ikaros Chess Festival is not a profit-making tournament for the organizers. At least this is not our main objective, that’s why we do not hesitate to offer good conditions to titled players who, in turn will attract more participants to the festival. Ikaros Chess Festival commenced 32 years ago as a friendly training tournament for the players of Ikaria Chess Club and the friendly atmosphere of the tournament remains until today. Our main aim is to offer to all participants the chance to combine chess with relaxing and cheap vacations and on the other hand attract people to the island in a period (middle of July) that is not the tourist high-season for Ikaria. This is important for the local economy since during the tournament all hotels, pensions, restaurants and bars are full with chess players . The main financial supporter of this initiative is the municipality of Aghios Kirykos, the capital of Ikaria and the site of the festival. Our budget is not very high but we are willing to provide good conditions not only to strong players (that increase the prestige of a tournament and thus attract more players) but also to lower rated players that’s why offer discount to families, junior players and club teams. 2. Accommodation (in double room, the food expenses, meals, breakfast etc are NOT included) for the period 11-19 July. 3. Round Trip (Piraeus-Ikaria-Piraeus) ferry tickets (C class on commercial ferries of the line (Does NOT include the fast ferry lines)) (Piraeus is the port of Athens). 4. Pocket money 2 (two) euros for each rating point above 2400 based on the FIDE rating list of 1st of July 2009. Assuming that a player’s rating is 2550 he/she will get (2550 – 2400) x 2 = 300 Euros as pocket money. This year we started the preparations quite early so we have already almost reached the maximum number of participants to whom we can offer conditions. Maybe we cold afford 4-5 more titled players, so if anyone is interested he/she should hurry up! The reason why we preferred to offer conditions based on the title, besides the rating ones, is that we are interested in giving the opportunity to the other participants to make international norms. In the past we had several players who made their norms at Ikaria, I believe this years that the field is expected to be quite strong that it would be a good chance for those seeking to achieve a norm. Chessdom: With the top conditions you mention, there are probably already requests for the event? Dimitris Skyrianoglou:Yes, there are several months to the event and we already have more than 40 confirmed foreign players (Greek participants usually contact us in June ), out of which 14 are titled GMs and 7 IMs. We also have several WGMs and WIMs. We are expecting many more players, as this is a nice opportunity to combine chess with family vacation. The players who came with their families can confirm that the combination of nice weather, beaches, etc. was a unique experience for their whole family. We have acquired some very loyal friends during all these years, people who return to Ikaria every summer or recommend the tournament to their friends. This is the best reward for us! Chessdom: Are there conditions and special offers for families? Dimitris Skyrianoglou: Yes we offer a 15% discount for families (at least 3 members), juniors (below 20 years of age) and club teams (with at least 4 members from the same club). So instead of the normal 300 euros price (that includes entry fee, accommodation -in double room, NO board expenses are included- and ferry tickets -C class, Piraeus-Ikaria-Piraeus-) they pay 255 euros per person for the period 11-19 July. For those who will pay before the 30th of June, in case they are eligible for the 15% discount, there is an additional 5% discount (so the respective price drops to 240 euros per person) while for those who are not eligible for any other discount, there is a 10% discount (so the price drops to 270 euros for them). I believe there are good conditions and special offers for practically everyone. On our part we always try to be honest with our guests and let then know in advance what to expect at Ikaria. Chessdom: Tell us more about the organization and the people behind the tournament? Dimitris Skyrianoglou: During all these 32 years a lot of people have been involved with the tournament but definitely the most prominent figure is this of Kosmas Kefalos, secretary of Ikaria Chess Club and head tournament director of Ikaros Chess Festival. Mr. Kefalos is truly the soul of the event putting a lot of effort, passion and love to it. 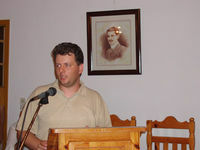 I should also mention the president of Ikaria Chess Club Giorgos Moraitis, and also Michalis Venios and Nikos Xenakis. A special mention also goes to Savas Kyriakou who is the all-around man of the festival before, during and after the event! Finally me, I usually introduce myself as the tournament director but this is merely a title. Like everybody else I am involved with almost everything regarding the festival… Last but not least I shouldn’t also forget to mention the mayor of Aghios Kirykos Mr. Spyros Teskos who strongly supports the tournament. all of them without exception help with the organisation. Chessdom: From what you say it looks like a very well planned and organized chess event with good traditions. Dimitris Skyrianoglou: Yes, it is like that. But let me say, it is not all about chess. 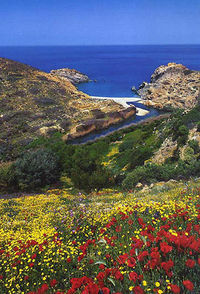 Ikaria is a nice place for relaxing vacations too. 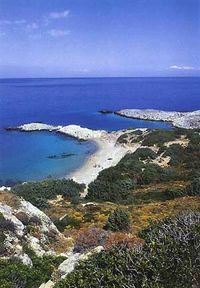 The island has several nice beaches (e.g. Armenistis. Gialiskari, Faros and many others) to visit which are also combined with the nice mountain countryside ideal for hiking and trekking activities. During July the weather is quite warm but the constant breeze that is characteristic of Ikaria makes the atmosphere very pleasant and suitable for such activities. NTV’s chess editor Marina Makarycheva performed an extensive interview with world’s highest rated player and world championship challenger Veselin Topalov. Ms. Makarycheva asked about the match with Kamsky, upcoming match with Anand, changes in the world championship cycle and other issues, and the interview was published on 8th April in Russian newspaper “Gazeta”. We present you the excerpts, read the full interview (in Russian) on Gazeta website. Makarycheva: On the match with Anand. When it will be held, and when do you plan to start with preparation? Topalov: Honestly, it does not depend only on me, but on Anand and, of course, on the FIDE as well. But most important – on the potential sponsors who can make their own suggestions. As for training, now I will carefully monitor all games played by Vishy. By the way, I have already examined carefully all of Anand’s games played in Linares. But returning to my play in Sofia, I can say that if I make the same mistakes in the match with Vishy, he will not forgive me. Makarycheva: And why, in your opinion, Vishy Anand appeared in Linares not as convincing as in previous years? Topalov: Well, first of all, Vishy Anand’s result in Linares can not be seen as failure. Linares is a very strong tournament. As for the reasons … I do not exclude the possibility that numerous celebrations and receptions for the world champion at his home in India, after Anand brilliantly defended his title, have played a role. It seems to me that Vishy was not able yet to fully restore his power. But in addition, Anand, of course, was under the severe pressure which all of the champions experienced sometime. First, everyone wants to play their best game against the champion, and second, the champion feels that, being in the focus of attention, he is required to show the play of the champions, and the result of the champions, but this is not always possible. I felt something similar three years ago, so I do not judge by hearsay. We should not forget that we have replaced the champions like Robert Fischer, Anatoly Karpov and Garry Kasparov, all of whom proved their superiority, which did not mean being merely first among equals, but ahead of everyone else, so the fans are expecting a similar feat from us, but with the current competition of such a high standard it is very, very difficult. Makarycheva: Recently, FIDE decided to change the regulation for the final competition of the next cycle. Originally the match between the winners of Grand Prix and World Cup was planned, but now this is replaced by a match-tournament of eight candidates. What do you think about this change of regulation? Topalov: My reaction was negative. After all, it is not a secret that had Kramnik won the match in Bonn, nothing would be changed in the rules, and Anand would be forced to fight for the return of his crown by going through the World Cup in Khanty-Mansiysk. While now the defeated player from the match in Bonn, Vladimir Kramnik, will enter the candidates tournament without qualification. On the other hand, we had a situation that “Global Chess” – the structure responsible for FIDE Grand Prix – failed to organize several events, the venue of which was quickly moved to other places and countries. Therefore, the situation is quite complicated. In short, I am against it, but I perfectly understand that developments in this domain do not depend of me. Makarycheva: But, on the other hand, you can also be seen as a person which took profit from the new decisions. One can never be absolutely certain that the win will always be on your side, and starting from the bottom of qualification process is always worse than a high position in the candidates tournament. A seat in the tournament has been reserved for you even if you lost the match against Kamsky, and now the defeated from your match with Anand also belongs in the tournament. Topalov: That is true, but I believe that it is very desirable, even necessary, to adhere to the papers once the contracts are signed and agreements are reached. Therefore, any changes in the cycle that is already running…well … it is not a good thing. In addition, it appears strange to me that FIDE sells all the rights of the final stages of the next cycle at a time when there is no clarity in the current cycle, that is my match against Vishy Anand. For me this is illogical. Makarycheva: Since you mentioned this match once again, the last question: is it possible to beat Vishy Anand? Topalov: Frankly speaking, by comparing my play in the match with Kamsky and the level demonstrated by Anand in his match against Kramnik, one can say that this goes clearly in favor of Vishy, but I will be well prepared and I hope to capture his world champion title. California’s #1 GM Varuzhan Akobian meeting the U.S. Champion GM Yury Shulman in a four day rapid match April 22-25, 2009. With average rating over 2630 ELO, Akobian and Shulman are surely among the most popular chess players in the USA. Derek Odom had the chance to speak to the organizer of this event and manager of GM Akobian, Thomas Southerland. Here is the exclusive interview for Chessdom.com. Derek Odom: How did this match come to be? What inspired you to make it happen? purposeful in their actions. These are the people that I want to work for. And of course there seems to be this vacuous abyss in the U.S. for these types of events. I guess I feel compelled to fill this void with something very special. to provide the absolute best conditions for the players. So, Lake County is the perfect combination for the match. D: Who is attending, recognizing and/or sponsoring the event? ChessToday, and ICC. They are promoting the event along with the good people of our community, including the Rotary Club, Robinson Rancheria, our local radio network, wineries, the County itself, and really just too many to mention here. I am entitled the organizer of this event, though in truth there are so many people involved without whose help it would simply not be possible. D: It seems a lot of people have gotten on board for this strong match. Do you think events like this affect the chess community in a positive way? competing in a match like this in America is motivating for players of every age. Exactly these types of matches could raise the interest in chess. I remember interviewing GM Denker back in 1996, Before the interview he played a simul. An old friend of mine and I attended the simul, and of course we both lost. Actually, GM Denker in his 70s Crushed both of us! -But the enthusiasm of the crowd was very energizing, which is surely good for Chess. D: Where does your inspiration come from, any role model? T: Oh, there are so many inspirations. I have learned a ton about promoting events from Don King, he’s the Master of course. And as far as execution? George Foreman taught me that “One should plan their work and work their plan” Which sounds alot like a strong chess player…. D: What is your relationship with GM Akobian? T: I am GM Akobian’s manager, business partner, student, and close friend. D: What is Akobian doing to prepare for the match? Is he optimistic? T: Well, he is a very graceful person as you know. Of course he will say that GM Shulman is a strong opponent, and that he just hopes for a good event for the fans. Though he is also a determined player who always looks for the win. D: Does GM Akobian have aspirations for the U.S. Championship? you will win it when you decide that your are ready to win it, the choice is yours”. And I truly believe that the choice is his, as on any given day he can hand any GM in this country a crushing defeat. He has the talent, the training, and the experience. At this point it is only psychological. D: Does GM Akobian participate in any community chess events, such as simuls? T: GM Akobian is very committed to giving back to the community. In April 2008 GM Akobian played a Free Simul at the Junior College in Santa Rosa, CA. Of course this is not typical to do this type of event for free, We felt very honored and everyone had a great time. Also GM Akobian teaches some of the nation’s brightest young players at the Karpov Chess Camp in Kansas. I keep saying to him that I think that this is the best work he is doing, these kids are being trained by a legend. D: Let’s go back to the event. What is the schedule of the four-day match? T: 2 rapid games 30 min each of the first three days, then 10 blitz games on Saturday. D: Both players are very strong in tournament play, and also in blitz chess. Do you think the 30 minute time control is a comfortable one for them? T: Yes, for sure they are both professionals. This is a great time control for the fans, moves on the run always make for interesting play at this level. D: Is there a website where chess enthusiasts can learn more about the match? T: Yes, Thank You, the official website is Chessmastered.com. All games will be available there as well, and also relayed on Chessdom.com. D: Thank you for the interview! T: Thank you for having me.